There must be an Appstore 101 rule somewhere that says: Thou shall not name your apps to resemble a highly successful app, because it will be highly suspect. In the case of Angry Sperms, the tongue in cheek reference to Angry Birds is therefore quite unfortunate, because I actually think that the game play is rather innovative and cute, and the app quality is not bad. At $0.99 without a free lite version, most people would be hard-pressed to justify downloading this game, thinking that it would turn out to be a lemon. So let me tell you more about Angry Sperms. Imagine if you are an Ovum (from the latin word for ‘egg’). Now imagine billions of sperm swimming towards you, trying to penetrate your outer shell in order to fertilise the ovum (aka You). Then imagine that you (as the Ovum) are able to dodge incoming sperm by tilting your iPhone or iPod Touch (and in turn moving the Ovum). If you happen to have any sperm latching onto you, you can get rid of them quickly by shaking your iPhone or iPod Touch. 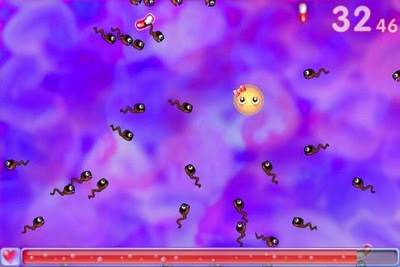 The game ends if you do not shake off the sperms in time! Now that you know how the gameplay is like, can you think of a better app name for Angry Sperms? How about Dodgy Egg? The developer of Angry Sperms is based in Seoul, Korea. They seem to be a pretty new set-up, not having had many other apps in the market yet. Their facebook and twitter presence is also very new (Facebook page over here).